Notts County have played their football at the Meadow Lane ground in Nottingham since 1910 when they moved from the Trent Bridge cricket ground due to fixture clashes with the cricket club causing controversy with the FA, they did though take part of the old ground with them by actually floating one of the stands across Nottinghams famous River Trent !! Meadow Lane is only 300 yards away from Nottingham Forests City Ground (the closest 2 grounds in England) and they have had share it with Forest on a couple of occasions, once following flooding in 1947 and then again in 1968 when fire damaged Forests City ground. 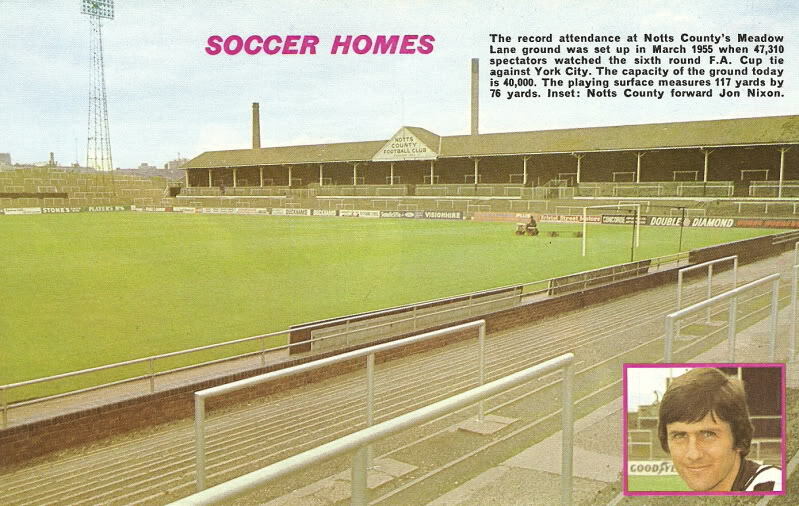 The picture below, from a 1970's Football Review magazine shows Meadow Lane as it used to be. "The record attendance at Notts Countys Meadow Lane ground was set up in March 1955 when 47,310 spectators watched the sixth round FA Cup tie against York City. The capacity of the ground today is 40,000. The playing surface measures 117 yards by 76 yards. Inset: Notts County forward Jon Nixon."